Behind our house, we have a wooded area filled with blackberry bushes, oak & cedar trees and lots of little creatures. and lead further into the woods. graciously hosted by Miss Bella. a french ticking quilt ~ soft blue stripes, tiny little flowers & scalloped edge- so charming! A diminutive bird feeder held a few starfish and a sweet lavender bouquet. A little bowl of fresh picked blackberries...yum! 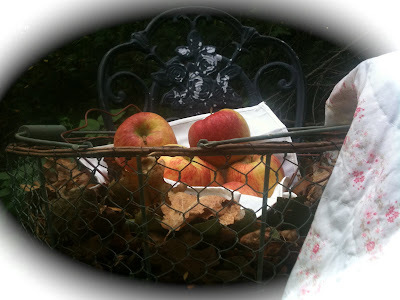 & a basket of harvest apples amongst the fall leaves. who were stopping by for a nibble and spot of tea. Is that them coming now? They just love a good party & wore their prettiest ribbon attire to the affaire! Such a lovely day for a tea! You just never know what you will find if you venture into the forest! Miss Bella took a little nap on one of the new pillows she has decided are hers. Welcome to Feathered Nest Friday No. 5! Last week- there were so many incredible participants!! 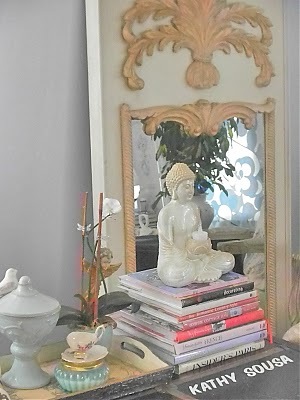 I just love seeing all the great decorating, inspirations, redo's etc! SO much talent out there and I am so happy to have you join the party! 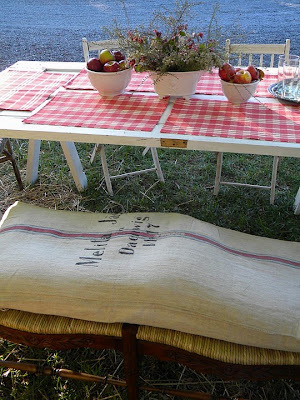 I just love it and her table setting- absolutely amazing! Marie from Marie's Maison shared her salon re-do- It is just beautiful! & that trumeau mirror? Oh my goodness... Love it! at A forty year old ranch are so, so charming! I think a bowl of them would be amazing- what a great project! Can't wait to see what inspirations are out there this week!! Link up what ever decorating, project, inspiration, etc. for feathering your nest you would like! 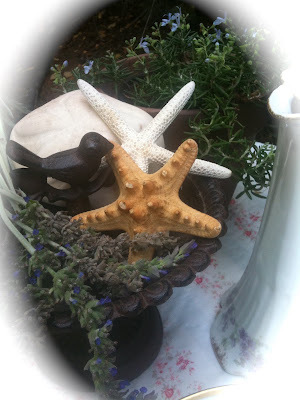 ~I would just love it if you would become a french country cottage follower if you aren't already!!! grab one of my new buttons if you would like! 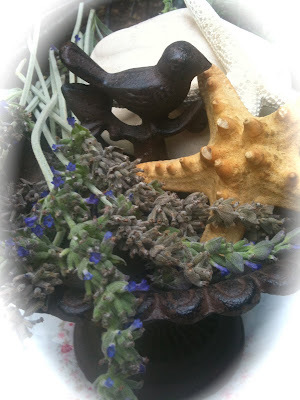 ~Go visit the other participants and gather up more inspiration for feathering your nest! hopefully mr. linky will be fixed soon!! Your little tea party story is so cute. I am sure Bella and her friends enjoyed it. Courtney, Miss Bella is adorable and looks like the perfect hostess! What a pretty setting for a party and I love your quilt and chocolate pot. Thanks for hosting! Bella is adorable. Such a sweet post. 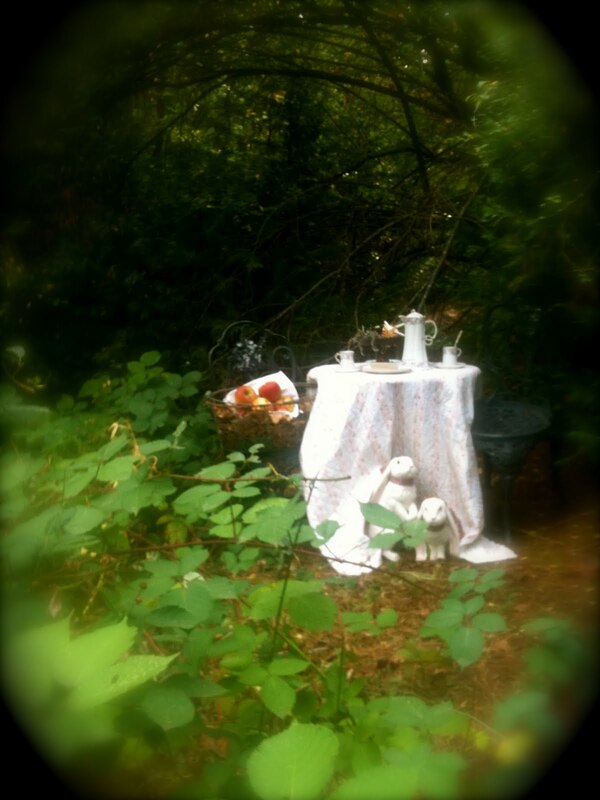 I love the pictures of the tea party in the woods. Just darling is little Bella! Joining in your party! Oh Courtney! I felt like I went on a little adventure there! 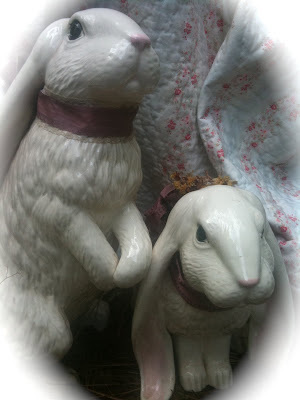 So perfect and sweet and kind of reminds me of Beatrix Potter with the bunnies sitting there! 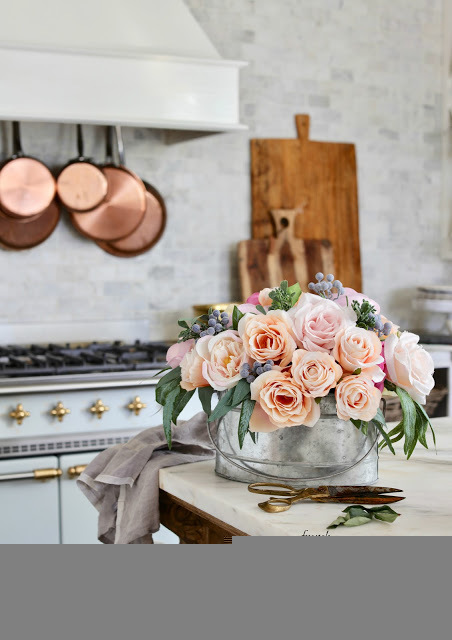 :-) Thanks so much for hosting the party and I am linking up another older post this week! I just found your blog and I love it! I also love French Country so, I have signed up as your newest follower and I have joined your fun party. Your little Miss Bella is so adorable! 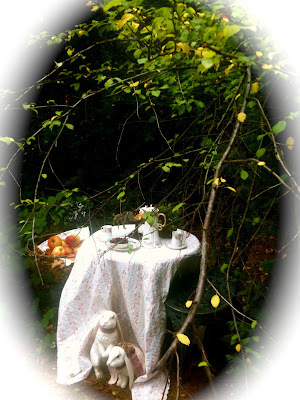 I have shared a table for my offering today although I do have a tea party going on in my previous post. 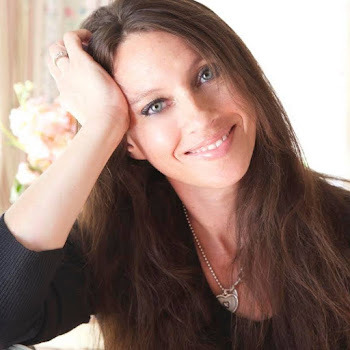 I do hope you will stop by; would love the company! Hope you have a wonderful weekend. Courtney, I'm trying to get my link up but it won't let me so I just wanted you to know that I'm going to keep trying and I didn't just forget about it! :-) Am I the only one frustrated with blogger lately? What a beautiful spot for an afternoon tea. I love it! Miss Bella is so cute! I love the sleeping photo. Thanks for hosting today. This was so sweet! I love a tea party and anything outside! Thank you for the feature! What a nice surprise to see, when I came over! That little Bella...too cute! 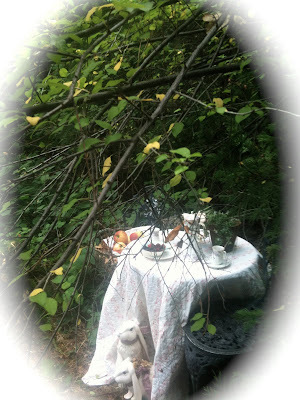 I linked my tea picnic! Have a wonderful weekend! What an adorable girl you have! Looks like she had a lovely tea party. 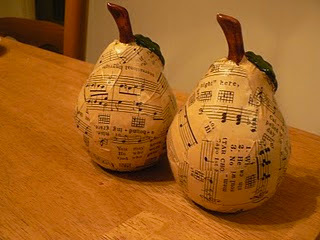 Thank you for featuring my pears! I would love to have been invited to Bella's tea party. Everything looks so good and pretty. I'm signing up to follow you. Hey Courtney ~ Love your forest tea party hosted by the lovely Miss Bella. I'll be joining your party later today! See you then ~ Cheers. It's so charming? Is my invite in the mail??? ; ) I hope you have a wonderful weekend. 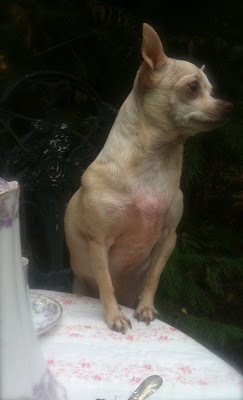 Bonjour Courtney - Coco, Simba and Maxx would have joined Bella's tea party too if we were close by. 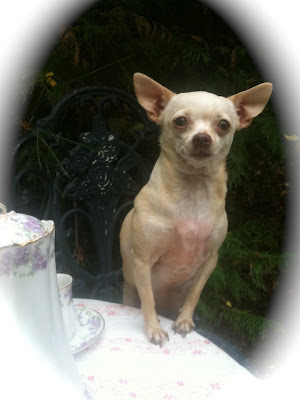 My pups love tea parties as well in fact, we're having High Tea for Halloween. Your tea set up is just fabulous and Bella is so lucky to be lying in one of the most beautiful french pillow. Thanks for the mention...glad to know you love my french trumeau. 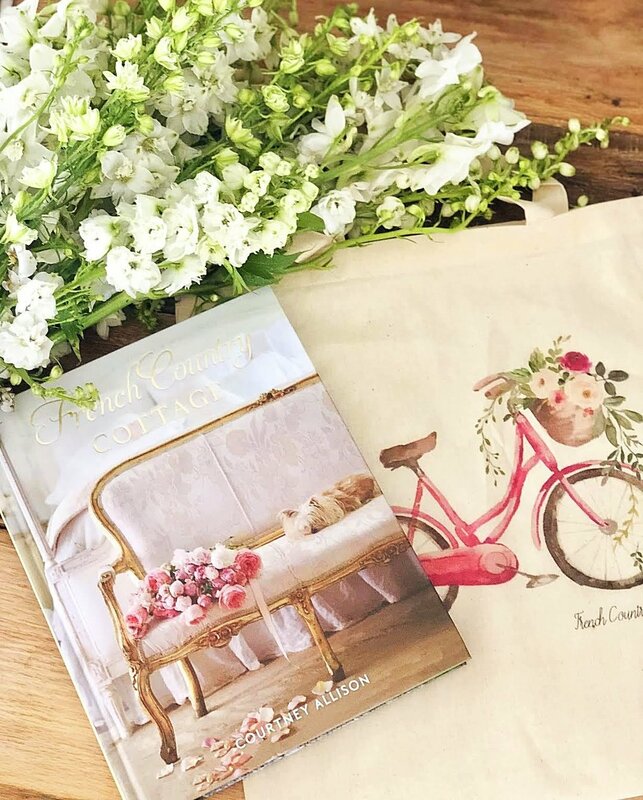 Isn't it great that your feathered nest party is just growing every week? Hi Courtney! Here I am! Thanks for the invite. Looks like you've got lots of great ideas linking up to your party today. I'm going to go check them out! I am excited to have found this party! enchanting! ;) thanks for visiting today! Thanks for dropping by and leaving a comment. Your little tea party is awesome. And Miss Bella is so adorable. I'm a follower now. Here's to more mutual blog visits! Hi Courtney! I'm a little late in coming, but I finally linke up. What a charming little tea party in the forest. Bella is a gracious hostess and the rabbits look happy to be there. thanks for visiting my blog. I'm so glad to find out about you and your lovely blog. I'm following you and will be back often. Very cute story! So sweet of Bella to host a party for her friends. I love the look of those fresh blackberries. Yum! Now that is the sweetest tea party, Courtney! I just love what you created. How lovely! Looks just like a scene from a fairy tale. What a sweet setting! I grew up with woods surrounding my house. I loved to explore through those trees! Where on earth (or in bloggland) have I been? I did not know that you have started this wonderful and inspiring new meme!!! I need to participate! YEA! YOur intimate chololate feast al fresco is lovely and your little pooches are just adorable. They seeem to love the setting as much as I would! Now off to visit the partygoers! I'll post next week with participating in mind. Miss Bella is too cute! You're blog is out of sight! 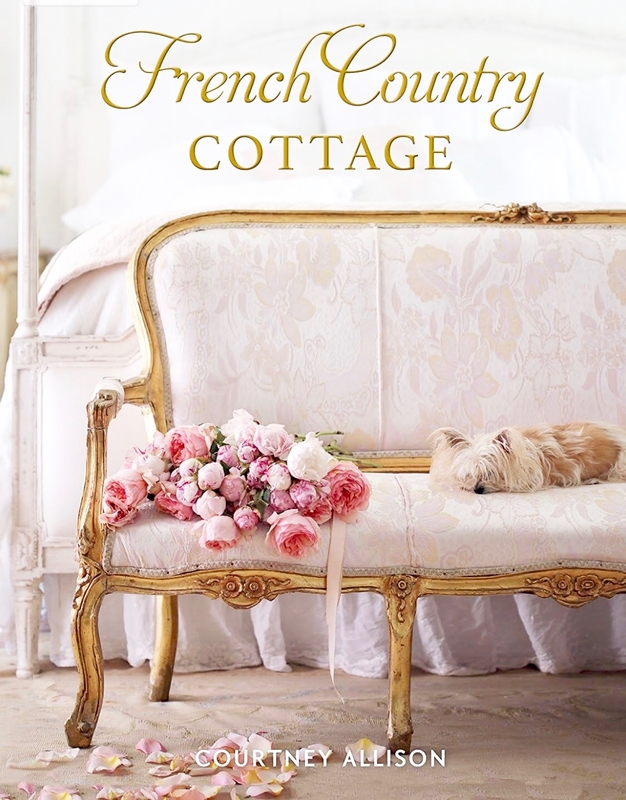 I love everything French, shabby and cottage. I want to tag along! Look forward to following! A great weekend to you! Thanks for stopping by. Loved the tea party post. We have a little Chi. dog too and she loves to lay on pillows also. Maybe because they are so small they need to lay on something that surrounds them to feel safe. They are great dogs aren't they? Miss Bella looks like a doll. I will try to join the party when I have something to share.